Even indoor, exposure to excessive Ultraviolet light and heat can cost you more than you probably realise. UV light and solar heat coming through any window can cause fading and irreparable damage to everything from your merchandise, furnishings and precious artifacts, to your very own skin. Ummato window films reject solar heat and block over 99% of harmful UV light and protecting you valuable assets and interior furnishing from expensive sun damage. Protection from UV light can be accomplished by a colorless film that addresses only the UV spectrum. The adhesive system used in window films rejects (absorbs)some UV radiation up to 380 nm, and depending on the manufacturer, UV inhibitors are added to the polyester. As UV is one of the main sources of fading, it can prolong the life of fixtures and fittings. Specialist UV window films are available that offer increased protection to 400 nm. These films are usually clear and are widely available. For yet further protection to 500 nm, Tinted Amber window films are available. Traditional heat control window films contain micro-thin layers of metal, which act as infra-red (heat) reflectors/absorbers and visible light filters. These layers are so thin that they are transparent, and as a result they can effectively block heat without blocking your view. 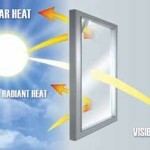 Windows play a vital role in the home’s energy efficiency allowing solar heat to enter in the summer months and home heat to escape in the cold months. 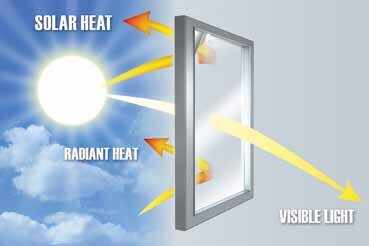 Windows typically account for 15 to 30% of the total heating load and may account for more than 50% during the summertime cooling load. The most cost effective way to cut home energy loss is to upgrade existing windows with the installation of Kylon heat control window film..
Kylon window film not only provides heat control for a more comfortable home, it also reduces annoying glare from the sun’s rays. Daylight can cast so much harsh glare on your TV that it strains your eyes and interferes with your viewing enjoyment. But you don’t have to close the curtains and shades to enjoy TV during the day. Kylon heat control window film is a quick, affordable solution to the problem of distracting glare. More than just tinting, Vista window film is an advanced, multilayer technology that lets in natural light while dramatically reducing glare. It even improves the insulation capabilities of your windows. So go ahead: turn on your electronics, open the curtains, and enjoy the views!